This article is about the person who designed the basic plan for Washington, D.C. (capital city of the U.S.). For his father, see Pierre L'Enfant (painter). Prince George's County, Maryland, U.S.
Pierre Charles L'Enfant (French: [pjɛʁ ʃɑʁl lɑ̃fɑ̃]; August 2, 1754 – June 14, 1825), self-identified as Peter Charles L'Enfant while living in the United States, was a French-American military engineer who designed the basic plan for Washington, D.C. (capital city of the U.S.) known today as the L'Enfant Plan (1791). L'Enfant was born in Paris, France on August 2, 1754, the third child and second son of Pierre L'Enfant (1704–1787), a painter with a good reputation in the service of King Louis XV of France, (1710-1774, reigned 1715-1774), and Marie L'Enfant, the daughter of a minor official at court. In 1758, his brother Pierre Joseph died at the age of six, and Pierre Charles became the eldest son. He studied art at the Royal Academy in the Louvre, as well as with his father at the Royal Academy of Painting and Sculpture. He left school in France to enlist in the American Revolutionary War on the side of the rebelling colonials. L'Enfant was recruited by Pierre Augustin Caron de Beaumarchais to serve in the American Revolutionary War in the United States. He arrived in 1777 at the age of 23, and served as a military engineer in the Continental Army with Major General Lafayette. He was commissioned as a captain in the Corps of Engineers on April 3, 1779 to rank from February 18, 1778. Despite his aristocratic origins, L'Enfant closely identified with the United States, changing his first name from Pierre to Peter when he first came to the rebelling colonies in 1777. L'Enfant served on General George Washington's staff at Valley Forge. While there, the Marquis de Lafayette commissioned L'Enfant to paint a portrait of Washington. During the war, L'Enfant made a number of pencil portraits of George Washington and other Continental Army officers. He also made at least two paintings of Continental Army encampments. L'Enfant was wounded at the Siege of Savannah on October 9, 1779. He recovered and became a prisoner of war at the surrender of Charleston, South Carolina on May 12, 1780. He was exchanged in November 1780 and served on General Washington's staff for the remainder of the American Revolution. L'Enfant was promoted by brevet to Major in the Corps of Engineers on May 2, 1783, in recognition of his service to the cause of American liberty. He was discharged when the Continental Army was disbanded in December 1783. Following the American Revolutionary War, L'Enfant established a successful and highly profitable civil engineering firm in New York City. He achieved some fame as an architect by redesigning the City Hall in New York for the First Congress of the United States (See: Federal Hall). L'Enfant also designed furniture and houses for the wealthy, as well as coins and medals. Among the medals was the eagle-shaped badge of the Society of the Cincinnati, an organization of former officers of the Continental Army of which he was a founder. At the request of George Washington, the first President of the Society, L'Enfant had the insignias made in France during a 1783-1784 visit to his father and helped to organize a chapter of the Society there. L'Enfant was a friend of Alexander Hamilton. Some of their correspondences from 1793 to 1801 now reside in the Library of Congress. While L'Enfant was in New York City, he was initiated into Freemasonry. His initiation took place on April 17, 1789, at Holland Lodge No. 8, F & A M, which the Grand Lodge of New York F & A M had chartered in 1787. L'Enfant took only the first of three degrees offered by the Lodge and did not progress further in Freemasonry. The new Constitution of the United States, which took effect in March and April 1789, gave the newly organized Congress of the United States authority to establish a federal district up to ten miles square in size. L'Enfant had already written first to President George Washington, asking to be commissioned to plan the city, but a decision on the capital was put on hold until July 1790 when the First Congress passed the "Residence Act", setting the site of the new federal district and national capital to be on the shores of the Potomac River. The Residence Act was the result of an important early political compromise between northern and southern congressional delegations, brokered by new cabinet members, Secretary of the Treasury Alexander Hamilton of New York and political opponent, Secretary of State Thomas Jefferson, of Virginia. It specified the new capital would be situated on the northern and southern banks of the Potomac River, at some location, to be determined by the president, between the Eastern Branch (now referred to as the Anacostia River) near Washington's estate of Mount Vernon and the confluence with the Conococheague Creek, further upstream near Hagerstown, Maryland. The Residence Act also gave authority to President Washington to appoint three commissioners to oversee the survey of the ten mile square federal district and "according to such Plans, as the President shall approve," provide public buildings to accommodate the Federal government in 1800. President Washington appointed L'Enfant in 1791 to plan the new "Federal City" (later named the "City of Washington") under the supervision of the three Commissioners, whom Washington had appointed to oversee the planning and development of the federal territory that would later become designated the "District of Columbia". Included in the new district were the river port towns of Georgetown (formerly in Montgomery County of the State of Maryland) and Alexandria (in Fairfax County, in the Commonwealth of Virginia). Thomas Jefferson, who worked alongside President Washington in overseeing the plans for the capital, sent L'Enfant a letter outlining his task, which was to provide a drawing of suitable sites for the federal city and the public buildings. Though Jefferson had modest ideas for the Capital, L'Enfant saw the task as far more grandiose, believing he was not only locating the capital, but also devising the city plan and designing the buildings. Facsimile of manuscript of Peter Charles L'Enfant's 1791 plan for the federal capital city (United States Coast and Geodetic Survey, 1887). L'Enfant arrived in Georgetown on March 9, 1791, and began his work, from Suter's Fountain Inn. Washington arrived later on March 28, to meet with L'Enfant and the Commissioners for several days. On June 22, L'Enfant presented his first plan for the federal city to the President. On August 19, he appended a new map to a letter that he sent to the President. President Washington retained a copy of one of L'Enfant's plans, showed it to the Congress, and later gave it to the three Commissioners. The U.S. Library of Congress now holds both the plan that Washington apparently gave to the Commissioners and an undated anonymous "dotted line" survey map that the Library considers L'Enfant to have drawn before August 19, 1791. The full plan identifies "Peter Charles L'Enfant" as its author in the last line of an oval in its upper left corner. The "dotted line" survey map may be one that L'Enfant appended to his August 19 letter to the President. L'Enfant's "Plan of the city intended for the permanent seat of the government of the United States..." encompassed an area bounded by the Potomac River, the Eastern Branch, the base of the escarpment of the Atlantic Seaboard Fall Line, and Rock Creek. His plan specified locations for two buildings, the "Congress House" (the United States Capitol) and the "President's House" (known after its 1815–1817 rebuilding and re-painting of its stone walls, as the "White House" or "Executive Mansion"). The "Congress House" would be built on "Jenkins Hill" (later to be known as "Capitol Hill"), which L'Enfant described as a "pedestal awaiting a monument". The "President's House" would be located at a northwest diagonal from the "Congress House" along the future Pennsylvania Avenue. The "President's House" would be situated on a ridge parallel to the Potomac River, north of a riverfront marsh and a canal (known as "Tiber Canal" or the "Washington City Canal" during the 1800s). L'Enfant envisioned the "President's House" to have public gardens and monumental architecture. Reflecting his grandiose visions, he specified that the "President's House" (occasionally referred to as the "President's Palace") would be five times the size of the building that was actually constructed, even then becoming the largest residence then constructed in America. Emphasizing the importance of the new Nation's Legislature, the "Congress House" would be located on a longitude designated as 0:0. The plan specified that most streets would be laid out in a grid. To form the grid, some streets (later named for letters of the alphabet) would travel in an east-west direction, while others (named for numbers) would travel in a north-south direction. Diagonal broader avenues, later named after the states of the Union, crossed the north/south-east/west grid. The diagonal avenues intersected with the north-south and east-west streets at circles and rectangular plazas that would later honor notable Americans and provide open space. Andrew Ellicott's 1792 revision of L'Enfant's 1791 plan for the "Federal City", later Washington City, District of Columbia (Thackara & Vallance, 1792). L'Enfant laid out a 400 feet (122 m)-wide garden-lined "grand avenue", which he expected to travel for about 1 mile (1.6 km) along an east-west axis in the center of an area that would later become the National Mall. He also laid out a narrower avenue (Pennsylvania Avenue) which would connect the "Congress House" with the "President's House". In time, Pennsylvania Avenue developed into the capital city's present "grand avenue". L'Enfant's plan additionally laid out a system of canals (later designated as the Washington City Canal) that would pass the "Congress House" and the "President's House". One branch of the canal would empty into the Potomac River south of the "President's House" at the mouth of old Tiber Creek, which would be channelized and straightened. L'Enfant secured the lease of quarries at Wigginton Island and further southeast along Aquia Creek off the lower Potomac River's southern bank in Virginia to supply well-regarded "Aquia Creek sandstone" for the foundation and later for the wall slabs and blocks of the "Congress House" in November 1791. However, his temperament and his insistence that his city design be realized as a whole, brought him into conflict with the Commissioners, who wanted to direct the limited funds available into construction of the Federal buildings. In this, they had the support of Secretary of State Thomas Jefferson. During a contentious period in February 1792, Andrew Ellicott, who had been conducting the original boundary survey of the future District of Columbia (see: Boundary Stones (District of Columbia)) and the survey of the "Federal City" under the direction of the Commissioners, informed the Commissioners that L'Enfant had not been able to have the city plan engraved and had refused to provide him with the original plan (of which L'Enfant had prepared several versions). Ellicott, with the aid of his brother, Benjamin Ellicott, then revised the plan, despite L'Enfant's protests. Ellicott's revisions, which included the straightening of the longer avenues and the removal of L'Enfant's Square No. 15, created changes to the city's layout (See: Randolph Square). Andrew Ellicott stated in his letters that, although he was refused the original plan, he was familiar with L'Enfant's system and had many notes of the surveys that he had made himself. It is therefore possible that Ellicott recreated the plan. Shortly thereafter, Washington dismissed L'Enfant. After L'Enfant departed, Andrew Ellicott continued the city survey in accordance with the revised plan, several versions of which were engraved, published and distributed. As a result, Ellicott's revisions subsequently became the basis for the capital city's development. The work of André Le Nôtre, particularly his Gardens of Versailles, is said to have influenced L'Enfant's master plan for the capital. "Morris' Folly". Engraving from 1800 by William Russell Birch. Soon after leaving the national capital area, L'Enfant prepared the initial plans for the city of Paterson, in northeast New Jersey along the Passaic River, but was discharged from this project after a year had passed. However, in 1846 the city reinstated the original scheme proposed by L'Enfant after the city's raceway system encountered problems. During the same period (1792–1793) he designed Robert Morris' mansion in Philadelphia, which was never finished because of his delays and Morris' bankruptcy. In 1794, L'Enfant was placed in charge of reconstructing Fort Mifflin on Mud Island in the Delaware River below Philadelphia. In 1812, L'Enfant was offered a position as a professor of engineering at United States Military Academy, at West Point, New York, but declined that post. He later served as a professor of engineering at West Point from 1813 to 1817. In 1814, L'Enfant worked briefly on the construction of Fort Washington on the Potomac River southeast of Washington, D.C., but others soon replaced him. Contrary to various internet postings, L'Enfant did not plan, survey or plat Perrysburg, Ohio, or Indianapolis, Indiana. Alexander Bourne, Joseph Wampler and William Brookfield surveyed and platted the future Perrysburg area in 1816. Alexander Ralston, an engineer who had assisted L'Enfant in the planning of the city of Washington, used elements of L'Enfant's plan for the federal capital city when designing and surveying the future city of Indianapolis (the state capital of Indiana) during the 1820s. Although the United States Congress had paid him for his work on the design of the City of Washington, L'Enfant died in poverty on June 14, 1825. He was originally buried at the Green Hill farm in Chillum, Prince George's County, Maryland. He left behind three watches, three compasses, some books, some maps, and surveying instruments, the total value was forty-six dollars. The National Mall was the centerpiece of the 1901 McMillan Plan. A central open vista traversed the length of the Mall. In 1901 and 1902, the McMillan Commission under the leadership of Senator James McMillan, (1838–1902), of Michigan, modified L'Enfant's plan within a report that recommended a partial redesign of the capital city. Among other things, the Commission's report laid out a plan for a sweeping mall in the area of L'Enfant's widest "grand avenue", which had not yet been constructed. The McMillan Plan has since been instrumental in the further development of Washington, D.C. (See: History of Washington, D.C. in the 20th century). At the instigation of a French Ambassador to the United States, Jean Jules Jusserand, L'Enfant's adopted nation then recognized his contributions. In 1909, L'Enfant's remains were exhumed from their burial site at Green Hill and placed in a metal-lined casket. After lying in state at the Capitol rotunda, L'Enfant was re-interred in front of Arlington House on a slope in Arlington National Cemetery in Virginia. His re-burial site overlooks the Potomac River and the portion of Washington, D.C., that he had originally designed. In 1911, a monument was placed on top of L'Enfant's grave during a dedication ceremony at which President William Howard Taft, Jusserand and Senator Elihu Root spoke. Engraved on the monument is a portion of L'Enfant's own plan in a diagram map, which Andrew Ellicott's revision and the McMillan Commission's plan had superseded. In 1942, an American cargo-carrying "Liberty" ship in World War II, named the S.S. "Pierre L'Enfant" was launched, part of a series of almost 2,000 ships mass-produced in an "assembly-line" fashion from eleven coastal shipyards. In 1970, she was shipwrecked and abandoned. L'Enfant Plaza, a complex of office buildings (with the 1972 headquarters of the United States Postal Service), with an adjacent L'Enfant Plaza Hotel, an office building and an underground parking garage and a long series of underground corridors with a shopping center centered around an esplanade ('L'Enfant Promenade") in southwest Washington, D.C., was dedicated in 1968. Meeting rooms in the L'Enfant Plaza Hotel bear the names of French artists, military leaders, and explorers. The central portion of the plaza contains an engraved map of the city by Pierre L'Enfant from 1791. Within the city map is a smaller map that shows the plaza's location. Beneath the L'Enfant Plaza is one of the central rapid transit busy Metro subway stops in Washington, D.C., the L'Enfant Plaza station. In 1980, Western Plaza (subsequently renamed to "Freedom Plaza") opened in downtown Washington, D.C., adjacent to Pennsylvania Avenue, N.W. A raised marble inlay in the Plaza's surface depicts parts of L'Enfant's 1791 plan for the City of Washington. The inlay contains an oval bearing the title of the plan followed by the words "By Peter Charles L'Enfant". In 2003, L'Enfant's 1791 Plan for Washington was commemorated on a USPS commemorative postage stamp. The diamond shape of the stamp reflects the original 100 square miles (259 km2) tract of land selected for the District. Shown is a view along the National Mall, including the Capitol, the Washington Monument, and the Lincoln Memorial. Also portrayed are cherry blossoms around the "Tidal Basin" and row houses from the Shaw neighborhood. The Government of the District of Columbia has commissioned a statue of L'Enfant that it hopes will one day reside in the U.S. Capitol as part of the National Statuary Hall Collection centered in the old chamber of the United States House of Representatives. As Federal Law currently only allows U.S. states (and not federal territories, commonwealths, districts or other possessions) to contribute statues to the Collection, the District of Columbia's Delegate to the U.S. House of Representatives, Eleanor Holmes Norton, is attempting to have the Congress change the law to permit the installation of the statue to represent the District in the Statuary Hall. The statue is presently displayed in the historic John A. Wilson District Building for the municipal government offices on Pennsylvania Avenue. Since 2005, the National Building Museum in Washington, D.C. has held an annual "L'Enfant Lecture on City Planning and Design" to draw attention to critical issues in city and regional planning in the United States. The American Planning Association (APA) has created an award named in L'Enfant's honor which recognizes excellence in international planning. ^ (1) L'Enfant identified himself as "Peter Charles L'Enfant" while residing in the United States during most of his life. He wrote this name on the last line of text in an oval in the upper left corner of his "Plan of the city intended for the permanent seat of the government of t(he) United States ...." (Washington, D.C.) and on other legal documents, including a 1791 deed (See: Bowling, 2002 and Sterling, 2003 Archived June 24, 2017, at the Wayback Machine). During the early 1900s, a French ambassador to the U.S., Jean Jules Jusserand, popularized the use of L'Enfant's birth name, "Pierre Charles L'Enfant". (See: Bowling (2002).) The National Park Service has identified L'Enfant as "Major Peter Charles L'Enfant" and as "Major Pierre (Peter) Charles L'Enfant" in its histories of the Washington Monument on its website. The United States Code states in 40 U.S.C. § 3309: "(a) In General.—The purposes of this chapter shall be carried out in the District of Columbia as nearly as may be practicable in harmony with the plan of Peter Charles L'Enfant." (2) "History of the Mall: The 1791 L'Enfant Plan and the Mall". A Monument To Democracy. National Coalition to Save Our Mall. Archived from the original on 2014-03-04. Retrieved January 4, 2015. We now know that L'Enfant called himself "Peter" and not Pierre. (2) Graham, Jed (July 21, 2006). "Architect Of A Capital Idea". Pierre Charles L'Enfant: Major, United States Army: Designer Of Washington, D.C. Michael Robert Patterson: Arlington National Cemetery website (arlingtoncemetery.net). Archived from the original on October 6, 2017. Retrieved January 1, 2018. L'Enfant served under Washington at Valley Forge, Pennsylvania, during the winter of 1777-78 and became known for his pencil portraits of officers, including Washington. ^ (1) De Groot, Kristen (Associated Press) (November 15, 2017). "Newly Discovered Painting Shows Washington's Wartime Tent". U.S. News & World Report. Archived from the original on January 1, 2018. Retrieved January 1, 2018. (2) Schuessler, Jennifer (November 15, 2017). "Washington's Tent: A Detective Story: How the Museum of the American Revolution found the only known depiction of George Washington's traveling headquarters during the Revolutionary War". Art and Design. The New York Times. Archived from the original on December 25, 2017. Retrieved January 1, 2018. (2) Herbermann, Charles, ed. (1913). "Pierre-Charles L'Enfant" . Catholic Encyclopedia. New York: Robert Appleton Company. (3) "History & Culture". Federal Hall National Memorial, New York. National Park Service: United States Department of the Interior. Archived from the original on 2017-02-08. Retrieved March 25, 2017. (2) Autograph letter signed. Pierre L'Enfant to Baron de Steuben, June 10, 1783. Society of the Cincinnati Archives, Washington, D.C.
^ (1) L'Enfant, P Charles. (March 26, 1793). "To Alexander Hamilton from Pierre Charles L'Enfant, 26 March 1793". Founders Online. National Archives and Records Administration. Archived from the original on December 31, 2017. Retrieved August 3, 2017. (2) L'Enfant, P. charles (July 1, 1798). "To Alexander Hamilton from Pierre Charles L'Enfant, 1 July 1798". Founders Online. National Archives and Records Administration. Archived from the original on December 31, 2017. Retrieved August 3, 2017. (3) L Enfant, P. charles (July 6, 1798). "To Alexander Hamilton from Pierre Charles L'Enfant, 6 July 1798". Founders Online. National Archives and Records Administration. Archived from the original on January 2, 2018. Retrieved January 3, 2018. (4) L'Enfant, P. charles (July 14, 1801). "Alexander Hamilton Papers" (manuscript). Collection Items. Library of Congress. Archived from the original on January 2, 2018. Retrieved January 2, 2018. (5) Hamilton, Alexander (July 27, 1801). "From Alexander Hamilton to Pierre Charles L'Enfant, 27 July 1801". Founders Online. National Archives and Records Administration. Archived from the original on January 2, 2018. Retrieved January 3, 2018. (6) L'enfant, P. charles (September 4, 1801). "To Alexander Hamilton from Pierre Charles L'Enfant, 4 September 1801". Founders Online. National Archives and Records Administration. Archived from the original on January 1, 2018. Retrieved January 1, 2018. (2) de Ravel d'Esclapon, Pierre F. (March–April 2011). "The Masonic Career of Major Pierre Charles L'Enfant". The Scottish Rite Journal. Washington, D.C.: Supreme Council, 33°, Ancient and Accepted Scottish Rite of Freemasonry of the Southern Jurisdiction: 10–12. ISSN 1076-8572. Archived from the original on December 31, 2017. Retrieved December 31, 2017. ^ Reps, John William (1965). "9. Planning the National Capital". The Making of Urban America. Princeton University Press. pp. 240–242. ISBN 0-691-00618-0. Archived from the original on April 26, 2016. At Google Books. ^ "An ACT for establishing the Temporary and Permanent Seat of the Government of the United States". Library of Congress. Archived from the original on May 7, 2016. Retrieved December 12, 2008. ^ Ellis, Joseph J. (2002). "The Dinner". Founding Brothers: The Revolutionary Generation. Vintage. pp. 50–52. ISBN 0-375-70524-4. Archived from the original on April 26, 2016. ^ a b c Leach, Sara Amy; Barthold, Elizabeth (July 20, 1994). "L'Enfant Plan of the City of Washington, District of Columbia". National Register of Historic Places Registration Form. United States Department of the Interior: National Park Service. Retrieved January 8, 2012. ^ a b Seale, William (1986). The President's House, Volume 1. White House Historical Association. pp. 1–4. ^ a b c L'Enfant, Peter Charles; United States Coast and Geodetic Survey; United States Commissioner of Public Buildings (1887). "Plan of the city intended for the permanent seat of the government of t(he) United States: projected agreeable to the direction of the President of the United States, in pursuance of an act of Congress passed the sixteenth day of July, MDCCXC, "establishing the permanent seat on the bank of the Potowmac": [Washington, D.C.]". Washington: United States Coast and Geodetic Survey. LCCN 88694201. Retrieved March 5, 2017. Facsimile of the 1791 L'Enfant plan in Repository of the Library of Congress Geography and Map Division, Washington, D.C.
^ Seale, William (1986). The President's House, Volume 1. White House Historical Association. p. 9. ^ L'Enfant, P.C. (June 22, 1791). "To George Washington from Pierre-Charles L'Enfant, 22 June 1791". Founders Online. National Archives and Records Administration. Archived from the original on December 31, 2017. Retrieved December 31, 2017. ^ a b Passanneau, Joseph R. (2004). Washington Through Two Centuries: A History in Maps and Images. New York: The Monacelli Press, Inc. pp. 14–16, 24–27. ISBN 1-58093-091-3. ^ a b c L'Enfant, P.C. (August 19, 1791). "To The President of the United States". L'Enfant's Reports To President Washington Bearing Dates of March 26, June 22, and August 19, 1791: Records of the Columbia Historical Society. Washington, D.C.: Columbia Historical Society (1899). 2: 38–48. Archived from the original on November 5, 2013. Retrieved December 28, 2011. ^ a b c d e f g h i j (1) "Original Plan of Washington, D.C." American Treasures of the Library of Congress: Imagination: Pierre Charles L'Enfant's 1791 "Plan of the city intended for the permanent seat of the government ....": Manuscript map on paper, 1791, Geography & Map Division. Library of Congress. August 29, 2010. Archived from the original on 2017-02-05. Retrieved March 5, 2017. Selected by Washington to prepare a ground plan for the new city, L'Enfant arrived in Georgetown on March 9, 1791, and submitted his report and plan to the president about August 26, 1791. It is believed that this plan is the one that is preserved in the Library of Congress. After showing L'Enfant's manuscript to Congress, the president retained custody of the original drawing until December 1796, when he transferred it to the City Commissioners of Washington, D.C. One hundred and twenty-two years later, on November 11, 1918, the map was presented to the Library of Congress for safekeeping. Note: The plan that this web page describes identifies the plan's author as "Peter Charles L'Enfant". The web page nevertheless identifies the author as "Pierre-Charles L'Enfant." (2) L'Enfant, Peter Charles; Library of Congress (1991). "Plan of the city intended for the permanent seat of the government of t[he] United States: projected agreeable to the direction of the President of the United States, in pursuance of an act of Congress, passed on the sixteenth day of July, MDCCXC, "establishing the permanent seat on the bank of the Potowmac"". Washington, D.C.: Library of Congress. LCCN 91684074. Archived from the original on March 1, 2005. Retrieved March 5, 2017. 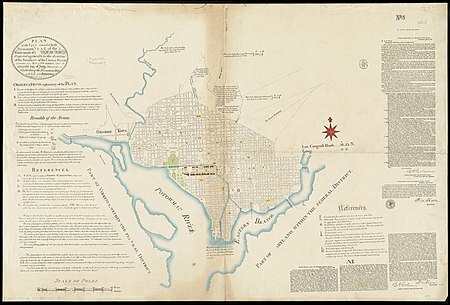 Full-color facsimile of Peter Charles L'Enfant's 1791 manuscript plan for the City of Washington in Repository of the Library of Congress Geography and Map Division, Washington, D.C.
(3) L'Enfant, Peter Charles; Library of Congress (1991). "Plan of the city intended for the permanent seat of the government of t[he] United States: projected agreeable to the direction of the President of the United States, in pursuance of an act of Congress, passed on the sixteenth day of July, MDCCXC, "establishing the permanent seat on the bank of the Potowmac"". Washington, D.C.: Library of Congress. LCCN 97683585. Archived from the original on March 6, 2017. Retrieved March 5, 2017. Computer-assisted reproduction of Peter Charles L'Enfant's 1791 manuscript plan for the city of Washington, produced by the U.S. Geological Survey for the Library of Congress in: Repository of the Library of Congress Geography and Map Division, Washington, D.C.
^ a b L'Enfant, Peter Charles (1791). "L'Enfant's Dotted line map of Washington, D.C., 1791, before Aug. 19th". Library of Congress. LCCN 88694203. Retrieved March 5, 2017. Accompanied by positive and negative photocopies of L'Enfant's letter to George Washington, Aug. 19, 1791, the original in the L'Enfant papers, no. 0215-977, L.C. Ms. Div. rn Repository of the Library of Congress Geography and Map Division Washington, D.C.
^ "A Washington DC Map Chronology". dcsymbols.com. Archived from the original on February 5, 2017. Retrieved September 30, 2009. ^ Faethz, E.F.M. ; Pratt, F.W. (1874). "Sketch of Washington in embryo, viz: Previous to its survey by Major L'Enfant: Compiled from the rare historical researches of Dr. Joseph M. Toner … combined with the skill of S.R. Seibert C.E." Map in the collection of the Library of Congress. Encyclopædia Britannica Online. Archived from the original on December 27, 2013. Retrieved April 3, 2012. ^ a b "The Mysterious Mr. Jenkins of Jenkins Hill". United States Capitol Historical Society. Spring 2004. Archived from the original on October 23, 2008. Retrieved September 14, 2009. ^ Federal Writers' Project (1937). Washington, City and Capital: Federal Writers' Project. Works Progress Administration / United States Government Printing Office. p. 210. ^ a b c d High resolution image of central portion of "The L'Enfant Plan for Washington" in Library of Congress, with transcribed excerpts of key to map Archived January 21, 2009, at the Wayback Machine and enlarged image Archived January 11, 2012, at the Wayback Machine in official website of the U.S. National Park Service Archived June 26, 2009, at the Wayback Machine. Retrieved 2009-10-23. ^ (1) Pfanz, Donald C. (February 11, 1981). "National Register of Historic Places Inventory Nomination Form: National Mall". National Park Service. Retrieved March 17, 2010. (2) Hanlon, Mary. "The Mall: The Grand Avenue, The Government, and The People". University of Virginia. Archived from the original on June 5, 2011. Retrieved May 5, 2010. (3) "The 1791 L'Enfant Plan and the Mall". National Mall History. National Mall Coalition. 2015. Archived from the original on 2015-10-01. Retrieved March 6, 2017. (4) Glazer, Nathan; Field, Cynthia R., eds. (2008). A Chronology of the Mall. The National Mall: Rethinking Washington's Monumental Core. Baltimore, Maryland: The Johns Hopkins University Press. p. 179. ISBN 978-0-8018-8805-2. OCLC 166273738. Archived from the original on May 14, 2015. Retrieved January 2, 2015 – via Google Books. ^ a b c (1) Tindall, William (1914). "IV. The First Board of Commissioners". Standard History of the City of Washington From a Study of the Original Sources. Knoxville, Tennessee: H. W. Crew and Company. pp. 148–149. Archived from the original on April 26, 2016. (2) Stewart, John (1898). "Early Maps and Surveyors of the City of Washington, D.C". Records of the Columbia Historical Society. 2: 55–56. Archived from the original on November 5, 2013. Retrieved December 27, 2011. ^ a b Ellicott, Andrew (February 23, 1792). "To Thomas Johnson, Daniel Carroll and David Stuart, Esqs." In Arnebeck, Bob. "Ellicott's letter to the commissioners on engraving the plan of the city, in which no reference is made to Banneker". The General and the Plan. Bob Arnebeck's Web Pages. Archived from the original on December 31, 2017. Retrieved December 31, 2017. ^ Kite, from L'Enfant and Washington Archived March 26, 2013, at WebCite" in website of Grand Lodge of British Columbia and Yukon, Ancient Free and Accepted Masons (Freemasons) Archived January 29, 2009, at the Wayback Machine. Retrieved January 11, 2009. ^ (1) Washington Map Society: Plan of the City of Washington Archived June 23, 2012, at the Wayback Machine. (2) Partridge, William T. (1930). National Capital Park and Planning Commission: Chart 6: L'Enfant and Ellicott plans superimposed. L'Enfant's Methods And Features of His Plan For The Federal City: Reports and plans, Washington region: supplementary technical data to accompany annual report: National Capital Park and Planning Commission. Washington, D.C.: Government Printing Office. p. 34. OCLC 15250016. Retrieved December 4, 2016. At HathiTrust Digital Library. (3) The U.S. National Archives holds a copy of "Ellicott's engraved Plan superimposed on the Plan of L'Enfant showing the changes made in the engraved Plan under the direction of President Washington". See "Scope & Contents" page of "Archival Description" for National Archives holding of "Miscellaneous Oversize Prints, Drawings and Posters of Projects Associated with the Commission of Fine Arts, compiled 1893 – 1950", ARC Identifier 518229/Local Identifier 66-M; Series from Record Group 66: Records of the Commission of Fine Arts, 1893 – 1981. Record of holding obtained through search in Archival Descriptions Search of ARC — Archival Research Catalog Archived May 1, 2017, at the Wayback Machine using search term L'Enfant Plan Ellicott, 2008-08-22. ^ Partridge, William T. (1930). L'Enfant's Methods And Features of His Plan For The Federal City. Reports and plans, Washington region: supplementary technical data to accompany annual report: National Capital Park and Planning Commission. Washington, D.C.: Government Printing Office. p. 23. OCLC 15250016. Retrieved December 4, 2016. At HathiTrust Digital Library. ^ a b c d e "The L'Enfant & McMillan Plans". Washington, D.C., A National Register of Historic Places Travel Inventory. United States Department of the Interior: National Park Service. Archived from the original on 2007-11-05. Retrieved March 4, 2017. ^ (1) Partridge, William T. (1930). L'Enfant's Methods And Features of His Plan For The Federal City. Reports and plans, Washington region: supplementary technical data to accompany annual report: National Capital Park and Planning Commission. Washington, D.C.: Government Printing Office. pp. 21–38. OCLC 15250016. Retrieved December 4, 2016 – via HathiTrust Digital Library. (2) Bowling, Kenneth R. (1988). Creating the federal city, 1774-1800 : Potomac fever. Washington, D.C.: American Institute of Architects Press. (3) Bryan, Wihelmus B. (1899). "Something About L'Enfant And His Personal Affairs". Records of the Columbia Historical Society. 2: 113. Archived from the original on April 26, 2016. Retrieved December 31, 2017 – via Google Books. ^ "André Le Nôtre". Encyclopædia Britannica. Encyclopædia Britannica Inc. March 12, 2012. Archived from the original on September 12, 2011. Retrieved March 12, 2012. (2) "Society for Establishing Useful Manufactures". Paterson Friends of the Great Falls. Archived from the original on August 24, 2011. Retrieved August 15, 2011. (3) "Introduction: Project Copy of the Calendar of the S.U.M. Collection of Manuscripts" (PDF). New Jersey Historical Records Survey. Paterson Friends of the Great Falls. Archived from the original (PDF) on 2015-03-11. Retrieved March 11, 2015. ^ History of Fort Washington Park, Maryland Archived February 11, 2009, at the Wayback Machine in official website of U.S. National Park Service Archived June 26, 2009, at the Wayback Machine Retrieved 2008-12-03. ^ (1) "Pierre Charles L'Enfant is Born". The American Patriotic Chronicle. Alabama Society, Sons of the American Revolution. August 2, 2016. Archived from the original on January 2, 2018. Retrieved January 2, 2018. ... (L'Enfant) did manage to work on several more public projects, including Fort Washington on the Potomac and the cities of Perrysburg, Ohio and Indianapolis, Indiana. ^ (1) Slocum, Charles Elihu (1905). History of the Maumee River Basin from the Earliest Account to Its Organization into Counties. Defiance, Ohio: Charles Elihu Slocum. p. 517. LCCN 05019553. OCLC 893929422. Retrieved January 2, 2018 – via HathiTrust Digital Library. (2) Thompson, Matt (April 10, 2016). "Perrysbury Turns 200: History sleuths say city's origin story false: Link to architect of D.C. questioned". The Blade. Toledo, Ohio. Archived from the original on January 2, 2018. (3) Gordon, Emily (April 14, 2016). "Survey says: Perrysburg wasn't platted by historic designer: Speakers rebut notion that L'Enfant laid out city". Sentinel-Tribune. Bowling Green, Ohio. Retrieved January 2, 2018. ^ (1) Morris, Martha Tucker (June 1920). "Christopher Harrison". Indiana Magazine of History. Bloomington, Indiana: Department of History of Indiana University. 16 (2): 109. Archived from the original on March 12, 2018. Retrieved January 2, 2018 – via Google Books. (2) "Alexander Ralston". Pioneer Information. The Cultural Landscape Foundation. 2016. Archived from the original on January 2, 2018. Retrieved January 2, 2018. (2) Claims of L'Enfant, Peter Charles: 1800-1810. Digested Summary and Alphabetical List of Private Claims which Have Been Presented to the House of Representatives from the First to the Thirty-first Congress: Exhibiting the Action of Congress on Each Claim, with References to the Journals, Reports, Bills, &c., Elucidating Its Progress. 2. Washington, D.C.: United States House of Representatives. 1853. p. 309. Archived from the original on May 18, 2015. Retrieved January 3, 2015 – via Google Books. .
^ a b c (1) Snell, T. Loftin (1950-07-30). "Maj. L'Enfant's Forgotten Grave". The Washington Post. p. B3. Retrieved December 31, 2017. (2) "Pierre Charles L'Enfant". Arlington National Cemetery: Historical Information. arlingtoncemetery.org. Archived from the original on 2010-07-04. Retrieved March 4, 2017. (3) Graham, Jed (July 21, 2006). "Architect Of A Capital Idea". Arlington National Cemetery Website: Pierre Charles L'Enfant: Major, United States Army: Designer Of Washington, D.C. Michael Robert Patterson. Archived from the original on 2016-05-26. Retrieved March 4, 2017. ^ ""Lying in State or in Honor"". US Architect of the Capitol (AOC). Retrieved 2018-09-01. ^ Miller, Richard E. (April 15, 2009). "Freedom Plaza Marker". Historical Marker Database. Retrieved November 22, 2010. ^ Busch, Richard T.; Smith, Kathryn Schneider. "W.7: Freedom Plaza: 13th and E Sts NW". Civil War to Civil Rights Downtown Heritage Trail. Washington, DC: Cultural Tourism DC. Archived from the original on December 31, 2017. Retrieved December 31, 2017. ^ "usps.gov — Nation's Capital celebrated on new commemorative postage stamp" (PDF). Retrieved January 13, 2009. ^ Ackland, Matt (January 27, 2011). "DC Seeking To Have Statues Displayed Inside US Capitol". Washington, D.C.: MYFOXdc.com. Retrieved January 8, 2012. ^ "L'Enfant Lecture on City Planning and Design". Adult Programs. National Building Museum. Archived from the original on November 12, 2011. Retrieved January 8, 2012. Berg, Scott W. (2007). Grand Avenues: The Story of the French Visionary Who Designed Washington, D.C. Pantheon Books. ISBN 978-0-375-42280-5. OCLC 70267127. Bowling, Kenneth R (2002). Peter Charles L'Enfant: vision, honor, and male friendship in the early American Republic. Washington, D.C.: George Washington University. ISBN 0972761101. LCCN 2003385101. OCLC 606900534. Retrieved June 24, 2017 – via Google Books. Sterling, Christopher (May 2003). "Revisiting an Old Controversy: Review of Bowling, Kenneth R. (2002), Peter Charles L'Enfant: vision, honor, and male friendship in the early American Republic". H-DC: H-Net Reviews: H-Net Humanities and Social Sciences Online. East Lansing, Michigan: The Center for Humane Arts, Letters, and Social Sciences Online: Department of History: Michigan State University. Archived from the original on June 24, 2017. Retrieved June 24, 2017. Bryan, Wilhelmus Bogart (1914). A History of the National Capital from its Foundation through the Period of the Adoption of the Organic Act. 1: 1790-1814. New York: The MacMillan Company. OCLC 902842081. Retrieved December 27, 2017 – via HathiTrust Digital Library. Caemmerer, H. Paul (1970). The Life of Pierre Charles L'Enfant. Da Capo Press. ISBN 0306713810. OCLC 99500. Jusserand, Jean Jules (1916). Major L'Enfant and the Federal City. With Americans of Past and Present Days. New York: Charles Scribner's Sons. pp. 137–195. OCLC 1075914 – via Google Books. Kite, Elizabeth Sarah (1929). L'Enfant and Washington, 1791–1792. Johns Hopkins University Press. OCLC 2898164. Morgan, James Dudley, M.D. (1899). "Maj. Pierre Charles L'Enfant, The Unhonored and Unrewarded Engineer". Records of the Columbia Historical Society. Washington, D.C.: Columbia Historical Society. 2: 118–157. Retrieved August 15, 2011 – via Google Books. Stewart, John (1899). "Early Maps and Surveyors of the City of Washington, D.C." Records of the Columbia Historical Society. Washington, D.C.: Columbia Historical Society. 2: 48–71. Retrieved August 15, 2011 – via Google Books. Worthington, Glen (May 1, 2005). "The Vision of Pierre L'Enfant: A City to Inspire, A Plan to Preserve". Georgetown Law Historic Preservation Papers Series. Paper 9. Retrieved September 2, 2011. Stephenson, Richard W. (1993). A Plan Whol[l]y new : Pierre Charles L'Enfant's Plan of the City of Washington. Washington, D.C.: Library of Congress. ISBN 0844406996. LCCN 92028798. OCLC 606533104. Retrieved June 22, 2017 – via Google Books. Wikimedia Commons has media related to Pierre Charles L'Enfant. This page was last edited on 7 March 2019, at 17:25 (UTC).